Remember when we got engaged? (I know, me too. It was a special evening for us at the alpine.) It was also the biggest instagram day I've ever had, my the coolest #mondaypunday to date and even Erica Weiner chimed in on the ring and the excitement. Since May 2nd a lot of life has happened. We've both changed jobs, the ring had an little accident (I mean it's 120 years old, it was bound to happen) and I scheduled, cancelled, rescheduled and finally participated in engagement photos. We celebrated my sister's beautiful wedding in October and watched she and my brother-in-law enjoy the day and the moment and the heart shaped confetti. It was truly special. We've made guest lists, remade guest lists, discussed the finer points of Google spreadsheets and avoided the guest list. 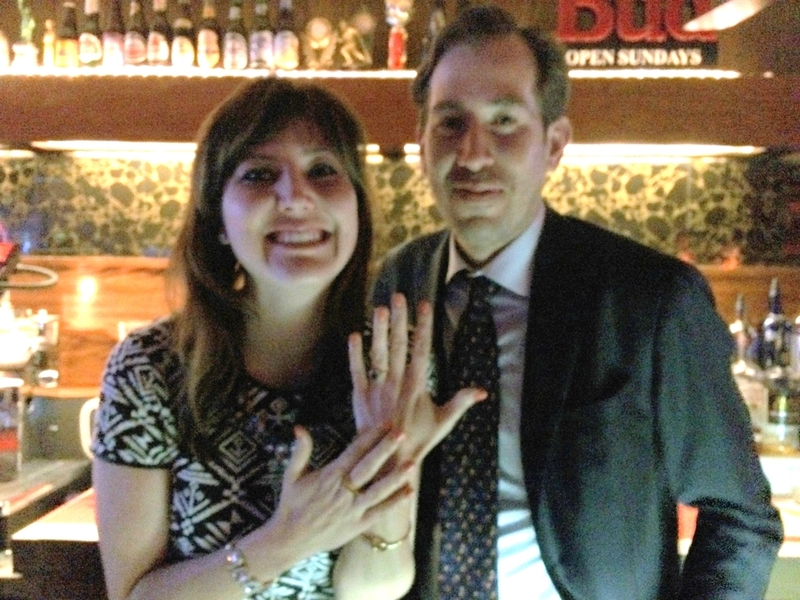 We've scrawled wedding plans on napkins and receipts while sipping beers at Proof. We've had little spats over the silliest things that under normal, non-wedding-brain-fueled circumstances ("ugh. Why can't you just get excited about gold ink? for once?") would be laughable. I've had weird nightmares where it's the night before the wedding and my teeth crumbled out of my mouth or there was a surprise bridesmaid understudy. I've stressed about paper quality, envelope weight and whether or not I should include "what a bummer" on my wedding invitations (spoiler alert, I went with it.) I've cursed myself for deciding to shake up our lives with new jobs and new bookshelves and new projects while trying to build a marriage (and plan a party). And then I've smiled a goofy, giant grin and gleefully danced in the printer's office. This wedding is the most exciting and stressful thing I've ever thought about. I'm not complaining, at all. I can't wait to be Kev's wife. (just typing that took my breath away a little. #nerdalert) I knew a wedding would be a little consuming, but I love party planning. LOVE IT. 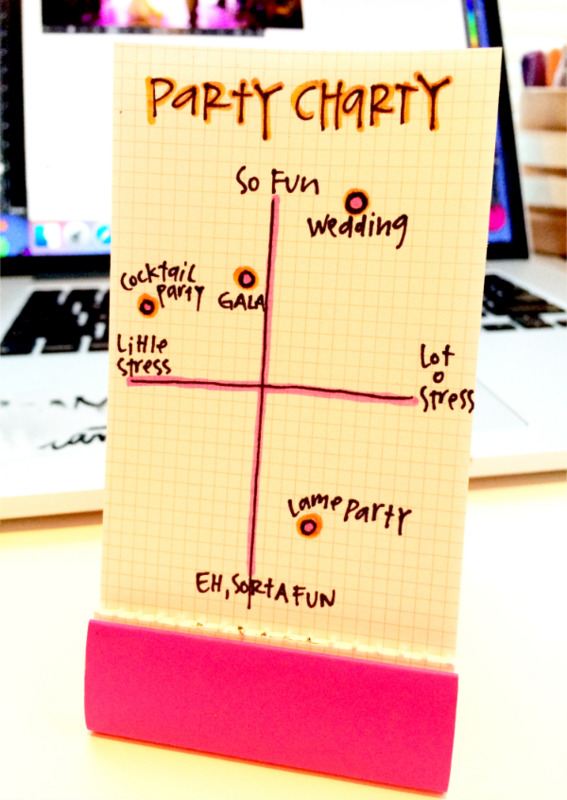 But party planning and gala planning and wedding planning, while all show up on the same stress/fun scale, they fall in different quadrants. There's the parties planned on someone else's budget, the parties where you just throw together a cheese plate and crack open a bottle o wine from Gateway, that party where the food is great and so is the dancing, but all you had to do was buy a ticket. (and the lame party, we've all been to one or planned one or both. it's ok. it happens sometimes.) Parties are generally fun, occasionally stressy, but typically fall high on the party charty. I don't want to feel stress, I want to make independent, thoughtful decisions, but pinterest. I know you, married people, put a lot of thought, hard earned cash and maybe a few tears into planning your personal day. Thanks for letting me be there and celebrate with you. I appreciate it, sincerely. Now back to comparing blue and white hydrangeas.